TCL 65C807 vs TCL 65S405 is the comparison of two 2017 models of C807 and S405 series. TCL 65C807 is close to high-end units as TCL 65S405 is a typical mid-range device. However, S405 offers LCD screens that have a wider viewing angle versus C807’s VA display. C807 has the Local dimming tech for making black zones really black. S405 can’t boast this but it is MHL- compatible to bring mobile entertainment to the big screen. TCL 65C807 vs 65S405 revealed the TVs great picture due to the NBP Photon tech. It provides more clarity and cleaner images on the edges. 65S405 reproduces a picture of the high quality with the great brightness and contrast. TCL 65C807 impresses with the perfect contrast (peak brightness of 350.38 d/m2, 0.03 cd/m2 black level for a 17.5 contrast ratio) that is not typical for the TVs in this price range. 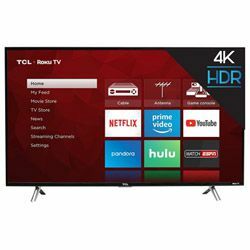 TCL 65S405 vs TCL 65C807 can hardly show any lack of both TVs’ quality. 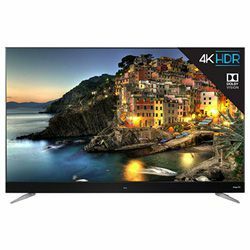 TCL 65S405 provides good 1080p upscaling. Besides, it has a nice frame rate and decent speakers you can hear the bass. However, they are not very loud that can be easily corrected via a couple of external hookups. TCL 65C807 has the lack of motion interpolation that affects the 60 Hz source content quality and may disappoint the soap opera effect lovers. Both TVs has a decent input lag performance but not perfect that’s why a slightly negative effect on picture quality is noticeable while playing games. The test TCL 65S405 vs 65C807 demonstrated TCL 65C807’s high-end design and TCL 65S405 basic one. TCL 65C807 has high-quality steel borders and front-facing sound bar. It is so slim that you can compare it with a modern picture on the wall. All of the inputs are on the side, so the connecting is very fast and simple. The cover hides all the inputs that’s why everything looks very neat. TCL 65S405 has plastic stand and borders and average thickness. Both TVs are flat and their stands are very wide and require a large table. It has very efficient Low Power mode to consume only 67W. Numerous additional apps for smartphones and tablets. Supplied remote batteries lasted just a week. Easy and comfortable remote with the set on only necessary buttons. Has the phone app with the same functions and options that remote has. You have to make picture settings while watching something because there is no opportunity to fix them beforehand.